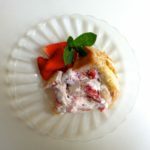 The easy way, as I discovered by calling a couple of French friends who gave me their grandmother’s recipes, is to skip the gelatin and simply layer quartered strawberries mixed with whipped cream into a mold lined with ladyfingers dipped in crème de cassis. Well, the cassis was my idea. Traditionally rum is used as flavoring. And this method is also the traditional one, passed along from mother to daughter over the generations. 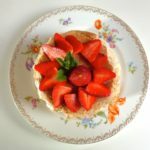 This entry was posted in Desserts and tagged charlotte, ladyfingers, recette, recipe, strawberries. Bookmark the permalink. Thank you for this charlotte, which sounds lovely, and so easy. Just a thought: as and when you make another one, might you be able to post a photo of it sliced so that we can see how it should be?